Master Tao Huang's latest book! 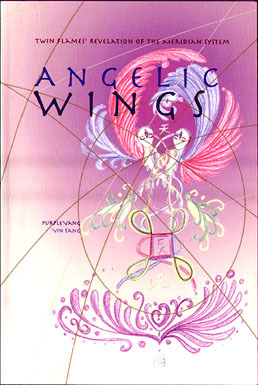 Written in an autobiographical style, Angelic Wings is a collaborative work, authored by Purple Yang and Yin Tang, each of whom give voice to Peace and Grace, respectively. Their story speaks to the highest concept of male and female in every reader to which word names and gender-identities can be given -- the primordial twins of brother-sister, male-female, Adam-Eve. The personal story they tell is not unique to them, individually. It is the story of every male and every female who genuinely surrender the search for external worldly fulfillment and completion in favor of internal re-union in original purity. Whatever is realized internally inevitably reflects or appears in the outer world. And so, Angelic Wings reflects for all what naturally unfolds when potentially-synergistic representatives meet and harmoniously work together to serve divine purpose. The impersonal story shares the esoteric side of the energetic meridian system as revealed to Master Huang over the course of his life. Informative beyond the traditional scope of Chinese medicine and qi gong literature, the book quenches the thirst for anyone who is hungry to understand the meridian structural system, and why and how vibration as 'sound' plays such a critical role in authentic Inner Alchemy. Only a Chinese master could tell this tale -- something Master Huang does superbly using a combination of linguistic, scientific, and intuitive content that stirs the slumbering to awaken and remember. Genuine gnosis is gifted by God's Grace - the revelatory light that dissipates falsities and defilements, revealing the true. Grace does the work of straightening the pathways for the coming of divinity's Truth and Peace. So as we read Angelic Wings, we might find the internal voice of Grace and Peace begin to stir within, and that what was once crooked, knotted, or misunderstood becomes straighter and less burdensome as we follow this tender love story of how Spirit leads soul to its necessary completion, and how that completing death appears in the reflection sphere we call the external realm.